Five key states, Uttar Pradesh, Punjab, Goa, Manipur and Uttarakhand, are currently in the middle of elections to choose local legislatures. A bottle, an air conditioner, a television set, a lantern, an arrow, a bicycle, a loaf of bread: these are not shopping items but some of the many objects voters will see on the electronic voting machines as symbols for the dozens of political parties and independent candidates in the fray. Symbols have been allocated to political parties since India’s first national election in 1951. Since barely a fifth of the population could read or write in the early 1950s, the symbols were introduced on ballot papers to help the unlettered cast their votes. Nearly three-quarters of Indians can now read but the icons remain evocative symbols of the major political groups. India’s best-known political symbols are the lotus flower for the governing Hindu nationalist Bharatiya Janata Party (BJP), and the outstretched hand or palm for the main opposition Congress party. The newest political party in the country, the Aam Aadmi Party, or the Common Man’s Party, chose the broom as its election symbol, reflecting their claim that they mean to sweep clean the political system. 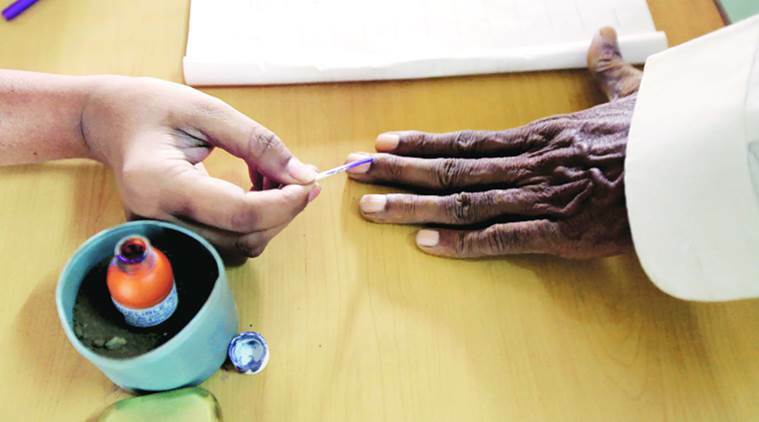 The choice of symbols still available for selection with the country’s independent Election Commission includes an electric pole, cricket bat, pliers and even food items including a coconut and a cauliflower. Also available: a toothbrush and nail clippers. Election season in India is the time when political parties offer freebies in return for the votes. On offer this year are promises of laptops, smartphones, spice grinders, fans and loan waivers. The governing BJP is even offering sugar and clarified butter at low prices in northern Punjab state. In the past, farm workers got cows and goats in a southern state. Freebies are a fact of life in Indian politics. Some 270 million people, nearly 22 per cent of the country’s population, live in poverty, making giveaways particularly attractive to voters. The election-season freebies, however, raise questions about a fair playing field for smaller parties and independent candidates. In the absence of laws barring such campaign promises, the practice continues. In India’s northern Uttar Pradesh, Chief Minister Akhilesh Yadav, the state’s top elected official, is promising free smartphones. In the previous 2014 election, he fulfilled his promise of free laptops for students after winning the vote. His main challenger, the BJP, also promised laptops, free internet and cooking gas to those who vote for them. Anonymous cash donations to political parties, running into billions of rupees (hundreds of millions of dollars) are seen at the heart of India’s endemic corruption. Only a quarter of the annual income of the two main political parties, the BJP and the Congress party, comes from known sources and are declared in their tax returns. The rest is from anonymous donors, according to the Association of Democratic Reforms, a non-political group working for governmental and electoral reform. Corruption is a top issue in the elections, which came on the heels of a surprise Nov. 8 announcement by Prime Minister Narendra Modi eliminating the country’s highest denominated currency bills in what he called an attack on tax fraud and graft. The government also appears to have taken some steps to bring transparency to party funding. On February 1, India’s Finance Minister Arun Jaitley announced in his budget speech that political parties will not be allowed to accept donations of more than 2,000 rupees ($29) in cash from an individual donor, instead of the 20,000 rupees ($295) allowed at present. A powerful regional group, the Bahujan Samaj Party, showed all donations it has received so far to be anonymous, below the legal limit of 20,000 rupees per donor. But several economists say that if the government were really serious about transparency, it should ban all cash donations.